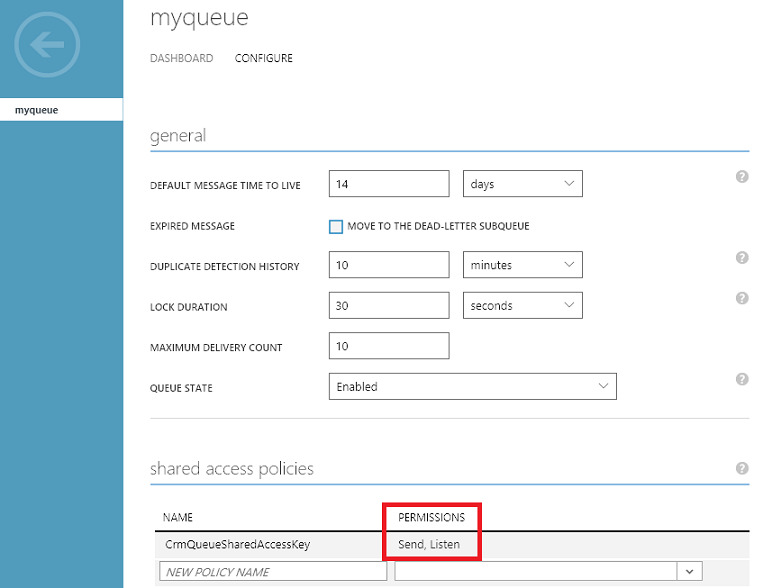 This walkthrough guides you through configuring the Microsoft Azure Service Bus issuer, scope, and rules to allow a listener application to read the Microsoft Dynamics 365 messages posted to the Microsoft Azure Service Bus. This walkthrough applies to any Microsoft Dynamics 365 deployment when using SAS authorization for Dynamics 365-Azure messaging. For more information aboutMicrosoft Azure Service Bus authorization see Service Bus authentication and authorization. This feature was introduced in CRM Online 2016 Update 1 and CRM 2016 Service Pack 1 (on-premises).. You must use the Plug-in Registration Tool from the v8.1 or later release of the Dynamics 365 SDK. Download the Microsoft Dynamics CRM SDK package. A Microsoft Azure account with a license to create Service Bus entities. A SAS configured service bus namespace. A SAS configured service bus messaging entity: queue, topic, relay, or event hub. The messaging entity must have the Send policy permission at a minimum. For a two-way relay, the policy must also have the Listen permission. The authorization connection string of your messaging entity. Refer to the Azure classic portal online help for instructions on how to create a Service Bus namespace and messaging entity. A ServiceEndpoint entity contains configuration data that is required for external messaging with a Microsoft Azure Service Bus solution endpoint. 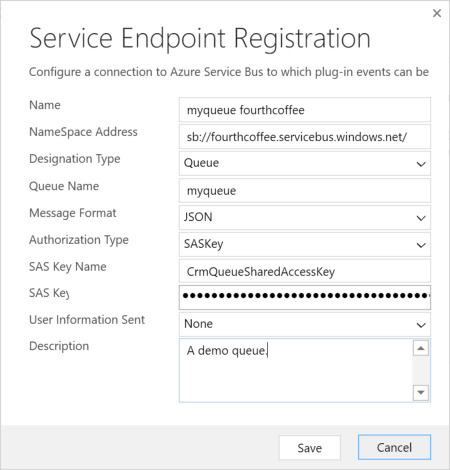 By using the Plug-in Registration Tool provided in the SDK download, you can easily create a service endpoint entity in a Dynamics 365 organization and configure the service bus endpoint issuer, scope, and rules. Run the Plug-in Registration Tool and log into your target Dynamics 365 organization. Select Register > Register New Service Endpoint. 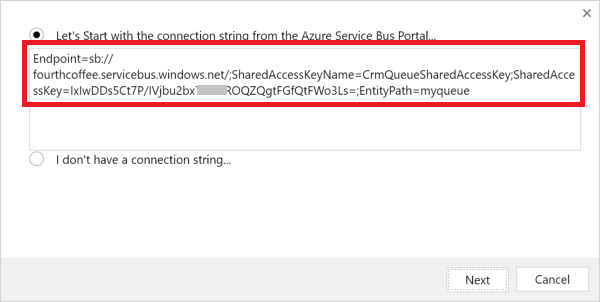 Check Let's Start with the connection string from the Azure Service Bus Portaland paste the connection string of your service bus messaging entity. For more information about the message format, see Write a listener for a Microsoft Azure solution. After a few seconds or so, you will see the new service endpoint in the Registered Plug-ins & Custom Workflow Activities list.